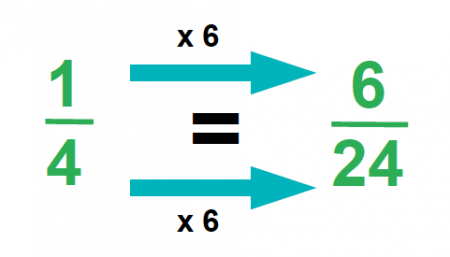 We explain what equivalent fractions are, how the concept of equivalence is introduced in primary school maths and how knowledge of equivalent fractions is then used to simplify fractions. When two fractions are equivalent, this means they are the same in terms of shape and size, but are expressed using different numbers. Children first learn about halving and quartering a shape in Key Stage 1. In Year 3 they are introduced to the concept of equivalence, where they are shown different shapes like the ones above and asked to write them as fractions. 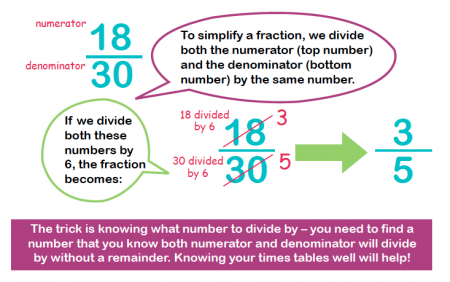 Children continue to practise equivalent fractions in Year 4 (such as 6/8 and 3/4 or 7/10 and 70/100) and it is expected that they will still need diagrams to make this clear to them at this stage. Children in Year 5 also need to relate fractions to their decimal representations (for example, they would need to know that 10/100 is 0.1 and 3/6 is equivalent to 0.5). One way of doing this would be to change all the denominators so that they were the same. This would mean multiplying the numerator and the denominator by the same number. You could change all the denominators to 12, so the first fraction would be multiplied by 4 to make 4/12. The second fraction would be multiplied by 3 to make 6/12. The third fraction would be multiplied by 2 to make 10/12. The fourth fraction would be multiplied by 4 to make 8/12. The last fraction would stay the same. This would mean you could compare and order the five fractions. In Year 6, children need to use their knowledge of equivalent fractions to simplify fractions. 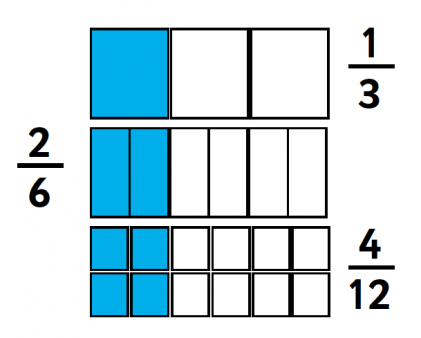 Simplifying a fraction means finding an equivalent fraction where the numbers are reduced as much as possible. For example, if I was given the fraction 6/48 and asked to simplify it, I could divide both numerator and denominator by 2 to make 3/24, I could then divide both numbers by 3 to make 1/8. A quicker way of simplifying the original fraction would be to divide both numbers by 6 to make 1/8.